The American Southwest is a favorite Rockhound destination for its many deserts and drylands. The region’s dry heat hosts an impressive variety of gemstones and crystals, many of which can be found on the surface or in a mine. This makes the southwest perfect for rare rock and mineral beginners who are starting their collections. 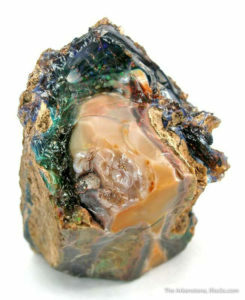 Opalized Limb Cast, Virgin Valley, Nevada, USA. Ex. Charlie Key collection. The State of Nevada hosts two of the major North American deserts – the Great Basin and the Mojave – with many smaller isolated deserts spread throughout the state. Of the state’s many deserts, the Virgin Valley is one of the most famous for its Black Opals and Fire Opals. To date, Black Opals can only be found in two places: Nevada, USA and Australia. The mines of the Virgin Valley are full of Tuff, a rock made from volcanic ash that blanketed a nearby forest roughly 17 millions of years ago. This lead to the creation of petrified wood that would later react with groundwater carrying silica, replacing the wood with prized Opal. The world’s finest Turquoise gemstones are found in New Mexico and Nevada. The Anasazi natives of the southwestern United States started mining for Turquoise in 1,000 AD, expanding throughout New Mexico and Arizona. 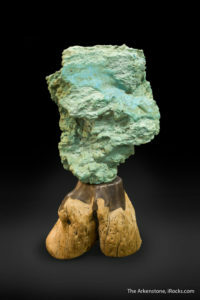 Turquoise receives its unique grayish green, blue, and smoky brown color from a hydrous phosphate chemical reaction within the veins of rocks. When water containing copper and aluminum seeps through the veins, the gemstone is left behind. The rare blue turquoise receives its color from a larger portion of copper, and green turquoise contains more iron. 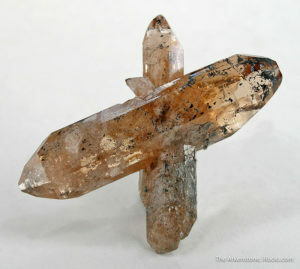 The Topaz is the official state gemstone of Utah with large crystals found throughout the state as well as Colorado and Texas. The Thomas Range in Utah has produced some of the largest, best-colored rare Topaz specimens in the world. The Topaz is a rare silicate mineral that forms within the cavities of igneous rocks like pegmatite and rhyolite. Nicknamed “water pebbles”, Topaz can be found along the stream sediments of igneous rocks. This led to a major discovery in the 1950s when Topaz were generally known to have a goldish color. However, Topaz specimens found along streams yielded a spectrum of colors, from blue to pink, due to UV exposure from the sun. Malachite and Calcite, Southwest Mine, Arizona. Kevin Brown Collection. Malachite is a popular gemstone for its striking green and dark-green, quill-like patterns. Found in copper mines of Arizona and New Mexico, the Malachite was used as prehistoric sculpting material as its colors didn’t fade over time or when exposed to light. Unlike other gemstones, Malachite is produced at shallower depths within the earth, just above copper deposits. 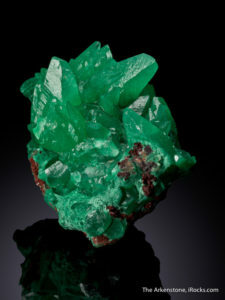 Most Malachite specimens form within the cavities of limestone where the chemical environment allows for the formation of carbonate minerals. Closed Japan Law twin, Washington Camp, Santa Cruz Co., Arizona, USA. There are few rare rocks and minerals as diverse as Quartz with large outcrops in south Arizona. 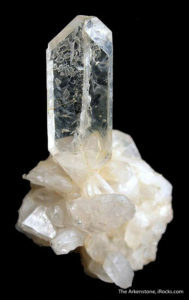 Most Quartz crystals are translucent with a raw pieces showing a powdery face. Their incredible durability and ability to grow into tremendous sizes makes Quartz crystals a favorite for Rockhounds. Quartz is made from silicon dioxide, a chemical compound consisting of silicon and two oxygen. Like the Turquoise, there are Quartz with variant colors like yellow, red, and black as a result of other impurities. The deserts and drylands of the American Southwest are home to many rare rocks and minerals that will inspire the collections of any Rockhound. If you’re ever traveling the southwest, take some time to enjoy the bountiful rare rock and minerals found in nature! To learn more about the many specimens detailed in this blog, see our rare rock and mineral collections at iRocks.com! Also, don’t forget to check our rare rock show listings for our other shows. The Arkenstone is proud to display many of its fine pieces at exhibits around the world. Compete for Tucson Show Awards!